The 1800's Style Black Powder Gun Holster is a well designed black powder style gun holster. Fully supported with three crossover straps that securely support the length of the gun. Fully lined and available in your choice of three colors: Black, Brown and Natural. **Gun and Powder Flask are not included. 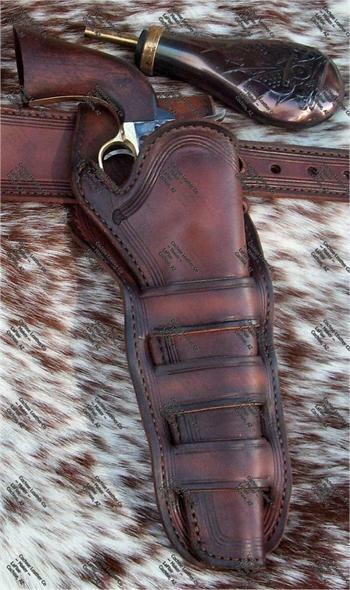 Our holster is made of 2 pieces 5-6 oz leather nap sides laminated together, smooth in/smooth out which creates a stronger holster that holds its shape better. High quality nylon thread is used for durability in the stitching of all our leather products. Cochise Leather Company is proud of the quality, durability and value that it gives in all of it's products which are hand cut and made by David LaFlair in his Cochise, AZ leather shop. Located just 25 miles east of the infamous old west town of Tombstone, Arizona.